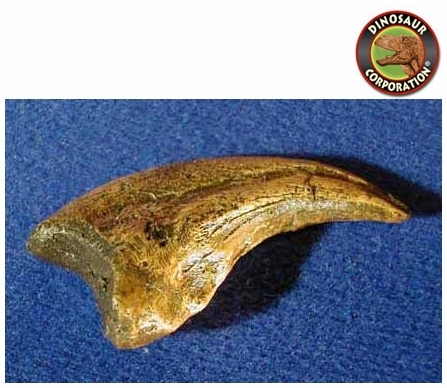 Dromaeosaurus Claw-albertensis Killer Claw. Judith river formation. Fossil Replica. Upper Cretaceous late Campanian Red Deer river Badlands. Drumheller Alberta Canada. Dromaeosaurus was a small carnivore, about 2 m (6 ft 7 in) in length and 15 kg (33 lb) in weight. Its mouth was full of sharp teeth, and it had a sharp "sickle claw" on each foot. It lived during the Campanian stage of the Late Cretaceous, however, some fragmentary remains such as teeth which may belong to this genus have been found from the late Maastrichtian age Lance and Hell Creek Formations, dating to 66 million years ago.